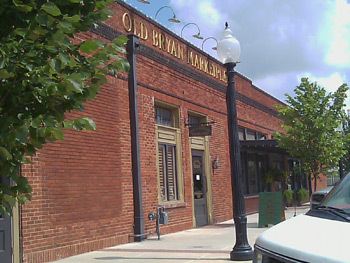 well known old buildings in Historic Downtown Bryan. Built in 1908 and added on to five times, this rambling 22,000 square foot building received a labor of love makeover in 1996 when purchased by Kay Conlee. Leaded glass doors, pine floors, bricked archways and fireplaces are just a beginning of its charm. Filled to the brim with treasures, both old and new, there's a sense of discovery throughout. Offerings abound... furniture, home accessories, gifts, florals, personalized invitations and stationery, collectibles easy to wear womens clothing lines like Flax and Johnny Was and a small comfy shoe collection. The owner is fourth generation Bryan resident, Kay Conlee. Her background includes a restaurant career, administrator of Brazos Christian School and a Master's Degree from Texas A&M University. While antiquing or “Junking” was simply a passionate pastime, Conlee never dreamed something she loved so much would become her business...her life! Awards have come Kay's way as she has worked to make her corner of Downtown the very best it can be ---an Historic Preservation Award in 1996, Newman 10 in 1998 and the first recipient of the Downtown Impact Award in 2000 have all encouraged her passion and energy for her own business and the revitalization of the Downtown area. All three of her children, Allison, Whitney and Grant, have at some point worked and added to the Marketplace. In December 2003, Grant graduated from Baylor and came home to add his full time energy and creativity to the store. We invite you to bring your friends and plan to stay awhile - just relax and enjoy the entire Old Bryan Marketplace experience. Browse. Visit. Have lunch. Christmas is coming and so is the beauty of the store during this joyous season. The Marketplace dazzles with gorgeous trees, unique gifts, cards, and the scent of the holidays. “Shop till you drop” this is NOT! Instead, simply a shopping experience that offers you a visit to Historic Downtown Bryan - specifically Old Bryan Marketplace where the quality, beauty and friendly service will welcome you. In Kay's eyes, a trip to Old Bryan Marketplace and the Downtown Area is “A Trip To Bountiful!